Does everything start spinning occasionally? How about your balance, is that up to scratch? And your hearing? Meniere’s affects one in every 600 Australians and it could be you. Long the ‘forgotten disease’, Meniere’s affects one in every 600 Australians. The disease occurs when there is excess fluid in the inner ear which disturbs the balance and hearing organs. Attacks can come on suddenly, and often people don’t know what to do. Symptoms include vertigo, tinnitus, fluctuating hearing loss and a feeling of pressure in the ear. The condition is generally diagnosed between the early thirties to fifties. While currently there is no cure for the disease, it is manageable by medication, diet and natural therapies. The symptoms can also be treated individually when suffered. It appears that there is not one single cause of fluid build up in the ears, but a number of contributing factors. While not all may relate to you, the condition may be caused by a number of elements. Essentially Meniere’s occurs when there is too much endolymph fluid in the inner ear. The pressure from this impacts the cells that are responsible for balance and hearing. As the disease progresses the cells become irreparably damaged, which is why there is no absolute cure, only treatment. When you suffer from vertigo, it seems like the whole world is spinning around you, especially when you move your head or change heights, for example stand up from a sitting position or sit up from a lying position. Attacks can be as short as 10 minutes or last several hours or even days. The dizziness and accompanying nausea can lead to severe problems with balance and may even cause you to stumble or fall. In extreme cases, you may experience vomiting. There may sometimes be warning signs including unsteadiness, ringing in the ears, feeling like your ear is full or a distortion in hearing. When you feel a vertigo attack coming on or if you’re already suffering, the best thing to do is get someone to take you to the doctor as soon as possible. Sometimes, all it takes is a repositioning of the crystals in the ear and the dizziness will stop. Other times, you may be prescribed medication or balancing exercises for long-term management. In laymen’s terms, tinnitus is generally associated with ringing in the ears. It can be unrelenting and continuous which means it is often quite a distressing symptom of Meniere’s. There is no cure, but there are techniques that may help manage some cases of tinnitus, including a good quality and properly fitted hearing aid, and lifestyle changes. Try easing off caffeine and alcohol, quit smoking, and stay physically and mentally active. Another way to help tinnitus is to trick yourself into listening to other peaceful noises such as the radio, relaxation music or ocean noises. 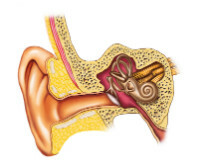 Meniere’s may result in loss of clear hearing, complete hearing loss or sensitivity to noise. It can also lead to a feeling of fullness where the ear feels under pressure and like it may burst. Michael has lost approximately 40 per cent of his hearing in his left ear. He says his family has become so used to his condition that he never has to remind them any more, they just automatically talk to his right ear. A pressure pulse device can be used to relieve the feeling of pressure in the ears. Unfortunately there’s not much that can be done when it comes to the loss of clear hearing besides having a hearing aid fitted. However, this is not guaranteed to work and can sometimes exacerbate the feelings of tinnitus. To ease the discomfort, Michael goes on cruises and lets the sounds of the ocean trick his brain to ignore the ringing in his ears. “I can go on a cruise for weeks and sleep without the radio under my pillow. It always seems to be okay. I always sleep.” Plus, he gets to see the world.